Apple introduced fundamental changes at the keynote in March, including the new MacBook and the innovative Force Touch touchpads. The update of the MacBook Air-series, however, was a pretty quiet process. It is just a hardware upgrade that is limited to the processor and the internal graphics solution. We want to use this review to analyze the performance differences and see whether there are consequences for the emissions and the battery runtimes. First of all we start with the noticeable price increase in the Eurozone. Our current review unit represents the base configuration. Instead of €900 (~$1014), the starting price is now €1,000 (~$1126). The price was, however, reduced from $1,000 to $900 in the United States. The hardware upgrades are more expensive as well. Our base model is equipped with 4 GB memory, a new Intel Core i5-5250U with the integrated Intel HD Graphics 6000 as well as 128 GB flash storage. 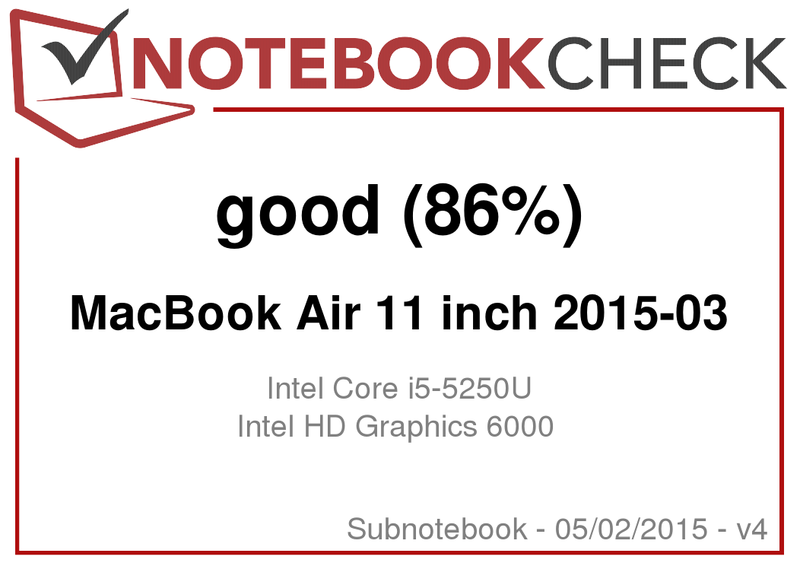 Our review update mainly covers the differences to the previously reviewed MacBook Air 2013, which was tested with the minimum specifications (Intel Core i5-4250U, 4 GB memory and 128 GB SSD) two years ago. Choosing a sophisticated 11-inch notebook is becoming more and more difficult. The competition prefers, besides the usual input devices, touch inputs for Ultrabooks and convertibles in this size. Lenovo, for example, offers such a convertible for around 1,370 Euros (~$1543). The Lenovo ThinkPad Helix 2 convinced us with a good display and the good system performance in our review. The MacBook Air has a TN panel with a resolution of 1366x768 pixels and an aspect ratio of 16:10. You will have to wait if you want the small device with a Retina display. You can see some individual pixels when you are used to high-resolution panels, but the manufacturer makes everything right in respect of the brightness and brightness distribution. We can measure an average luminance of 350 cd/m² and the display leaves a very good first impression with a brightness distribution of 90%. The glossy panel is supposed to improve the color brilliance. You will have a hard time if you want to find an 11-inch device with a matte panel in this class. Although the brightness was slightly increased according to our measurements, the black value was improved to 0.493 cd/m², which results in a better contrast of 746:1. The black value is okay for everyday tasks, but the contrast could be higher at the maximum brightness level. We could not determine PWM flickering in a video test (60 fps), even with a dimmed panel. 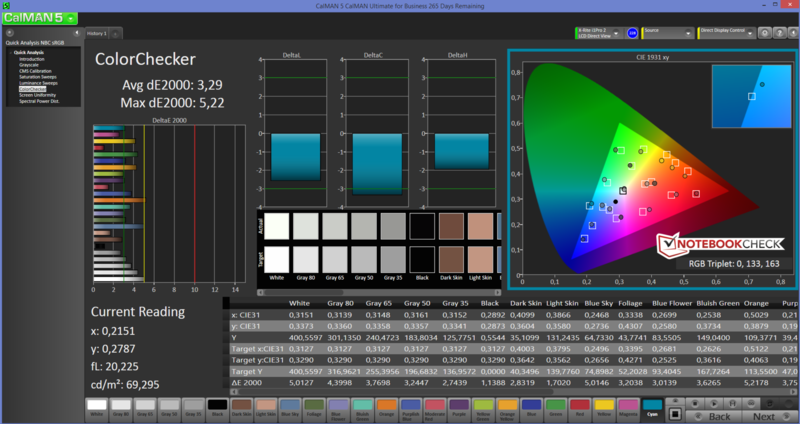 The available color space is not sufficient for professional graphics applications (AdobeRGB 39.8% and sRGB 55.2%). The integrated TN panel is already pretty well-calibrated under Mac OS X ex-works and we cannot notice a blue cast. The deviations are low at 3.06 for the grayscale and 3.23 for the colors. 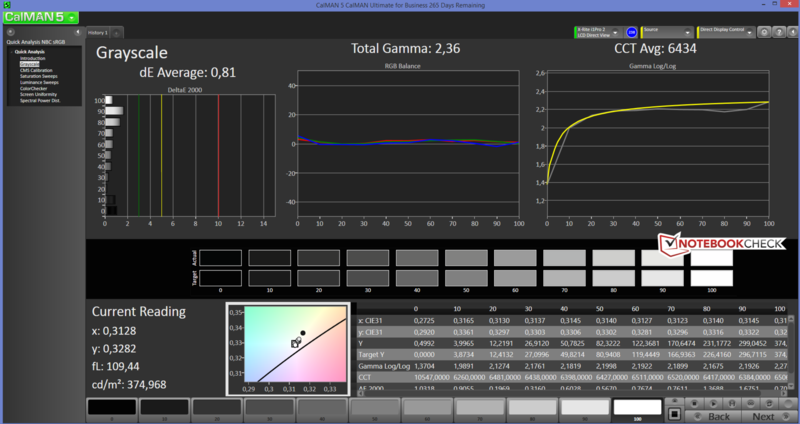 Calibration improves these DeltaE values to 0.81 (grayscale) and 1.59 (colors) according to our CalMAN analysis. These results are pretty good for a TN panel and even surpass some IPS panels. 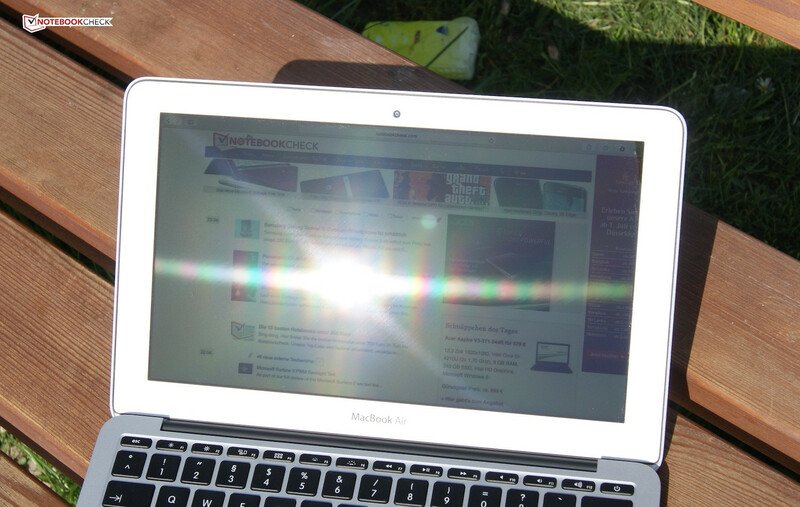 Thanks to the high luminance, you can actually use the small 11-inch device outdoors. Apple uses a special coating to reduce reflections, but you should still avoid direct light sources behind the display. 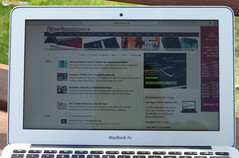 We were already able to test this detail in the review of the Apple MacBook Pro 2013. Using the device in the shade is usually no problem. 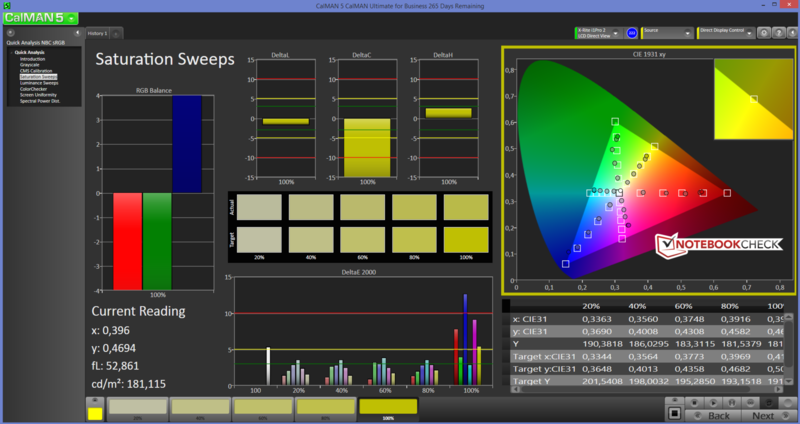 ...thanks to its good luminance. Because of the TN technology there will be some deviations of the colors and the brightness when you look at the display from the side. It is still one of the better products based on this technology. The opening angle of almost 135 degrees is usually sufficient and you can even use the laptop on your lap, but we would still appreciate a bigger angle. As always, Apple offers different configurations, and we have a look at the base model in this review. The hardware components are perfect for an office device or small multimedia notebook for every day. 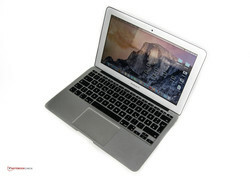 The small MacBook Air is equipped with a frugal dual-core processor that is fast enough for office and multimedia tasks. The processor graphics card is supported by a dual-channel memory configuration. 128 GB storage should be sufficient for many users; an upgrade to 256 GB is pretty expensive at 250 Euros (~$281). An upgrade by the user is not easy, which is proven by our colleagues from ifixit. The more powerful Intel Core i7-5650U CPU is available for 200 Euros (~$225). 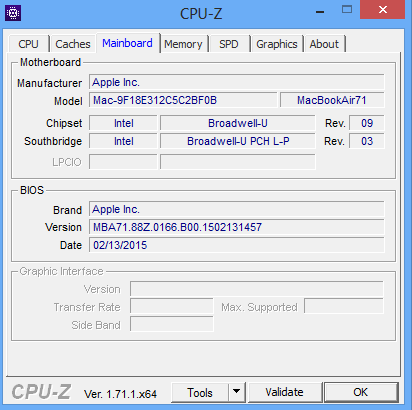 Apple uses this update to equip the device with chips based on the Broadwell architecture. Our configuration of the MacBook Air uses the Intel Core i5-5250U. This processor has two cores and can execute four threads. 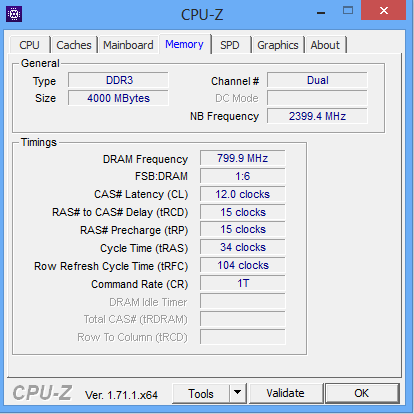 The base clock is now 1.6 GHz and was increased by 100 MHz compared to our old review unit. The chip can reach up to 2.7 GHz via Turbo Boost. 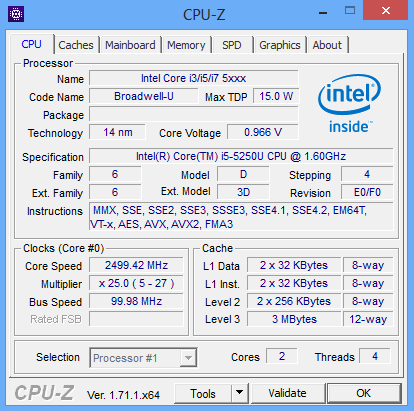 Intel specifies a maximum power consumption of 15 Watts (TDP). We use Cinebench R15 to determine the performance of both operating systems because the tool is compatible with both systems. Our review unit manages around 260 points in the multi-core test, it does not matter which OS you use. 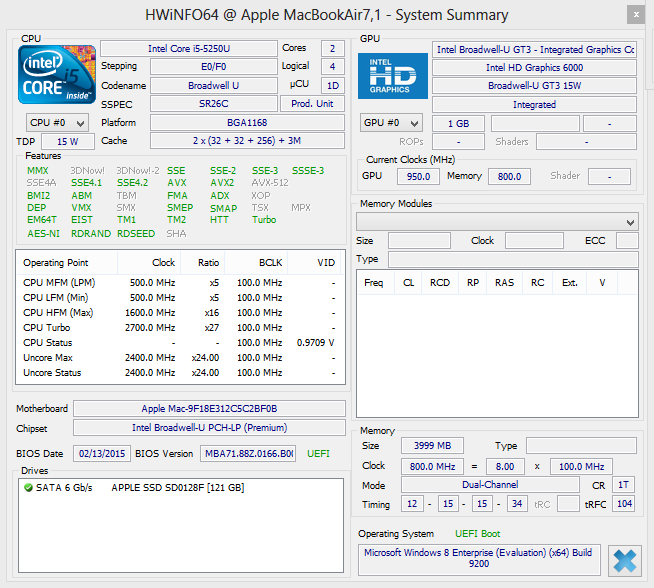 The current MacBook Air has an advantage of around 11% over the old model from 2013 in Cinebench R11.5. We can see bigger differences between the individual operating systems in the single-core test and the OpenGL benchmarks. 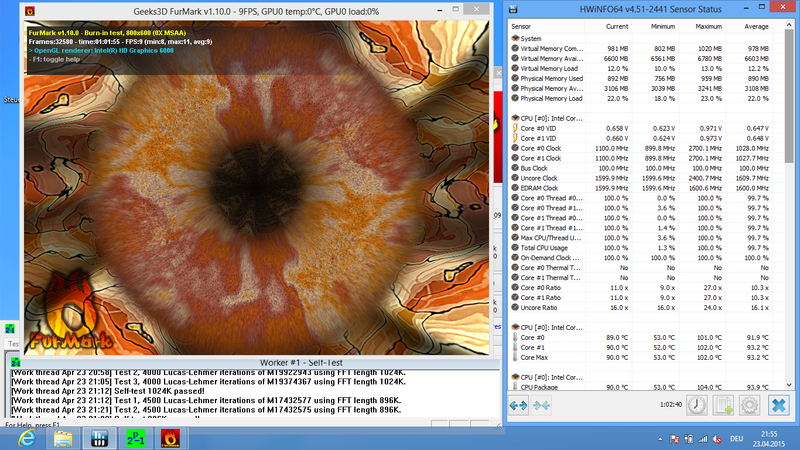 The single-core test under Windows determines 41% more points and the OpenGL test 30 instead of 26 fps. The maximum clock of 2.5 GHz was maintained during the whole first run of the benchmark and the CPU temperature reached 97 °C. We were able to measure 98 °C after multiple runs, but there was no sign of throttling. Running on battery power does not affect the performance and the results are similar compared to mains power. More comparisons and details are available in our list of current mobile processors. Working with the small test model is a joy since everything is smooth and the responsiveness is very good. You should think about 8 GB RAM or a more powerful processor if you plan to use more demanding applications. PCMark 7 supports our subjective impression and determines a good result of 5,200 points for the MacBook, which is much better than the Apple MacBook Air 11 from 2013 that scored around 900 points less. Apple uses an M.2 SSD with a storage capacity of 128 GB. We already mentioned that an upgrade to 256 GB is available for 250 Euros (~$281). Nothing really changed in respect of the transfer rates (read & write) compared to the predecessor. The integrated SSD manages decent results for the read and write performance, but Apple could improve the performance for the important 4K files. 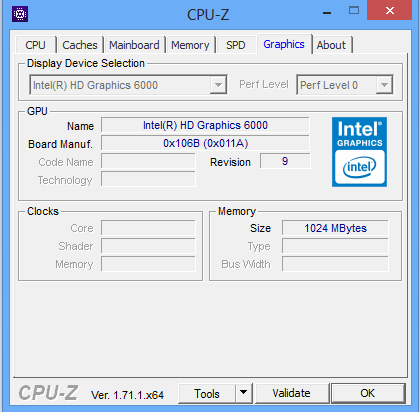 Another big improvement of the Broadwell architecture is the integrated Intel HD Graphics 6000 processor GPU. It is supposed to be 20-25% faster than the predecessor Intel HD Graphics 5000. 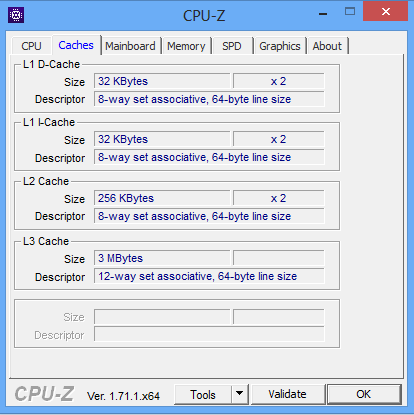 The GPU also supports important standards like DirectX 11.2, OpenCL 1.3/2.0 and OpenGL 4.3. We can measure a core clock of 950 MHz. We use 3DMark 11 to compare the new GPU with the Intel HD Graphics 5000 in the predecessor. As expected, the performance is much better and the predecessor falls behind by around 14%. The difference is even bigger in the Ice Storm benchmark of 3DMark (2013) with 30%. More details and comparisons for the HD Graphics 6000 are available in our Tech section. No question, gaming is not a strength of the Air 11, but some older titles should still run smoothly. It is important that you use Windows for gaming. A good example is Tomb Raider, where you can determine 31.2 fps with the lowest quality settings under Mac OS X, but the Air actually manages almost twice that under Windows. Even medium settings are playable under Windows 8.1 at 33.4 fps. If you still want to use the small 11-inch device for gaming and have some time and money, you can also attach external graphics cards via Thunderbolt. More details on that are available in our article "external graphics cards." Our review unit is completely silent with light workloads. The heat-conducting characteristics of aluminum help in this respect. The fans will only start to spin under load and we can measure up to 43 dB(A). This value is 4 dB(A) higher compared to the MacBook Air from 2013. The maximum fan speed of our review unit is 6,500 rpm. As long as you do not stress the device or just browse the web, for example, the review unit hardly gets warm. The aluminum chassis will only warm up noticeably under sustained load. The hotspot of 44.5 °C at the top (at the rear) is in the working environment. It is still no problem to type on the keyboard, despite the higher temperatures. All in all, the temperature development hardly changed. The power adaptor also gets quite warm at 47 °C, so you should not hide it under pillows or blankets. 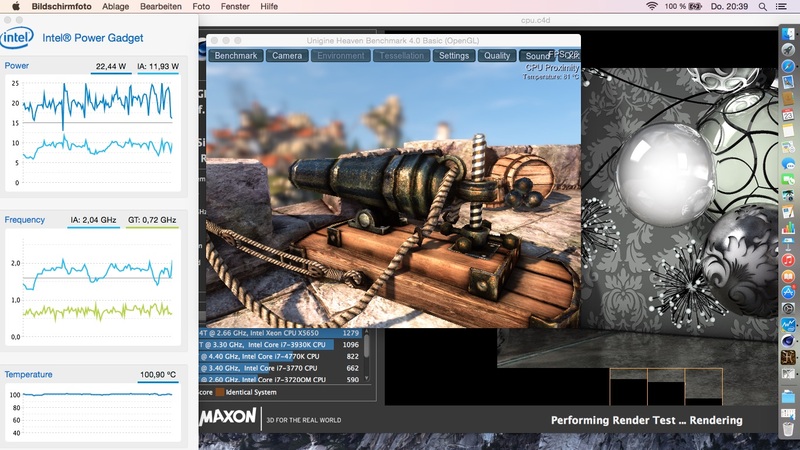 We realize the stress test under Mac OS X with the applications Cinebench R15 and Unigine Heaven 4.0. After the start of the two applications, the CPU temperature reaches more than 100 °C, so the CPU has to reduce the clocks. Even the nominal clock can often not be maintained. After the stress test we start Cinebench R15 and get the same score compared to a cold run. We use the tools FurMark and Prime95 for the Windows stress test. The processor clock is reduced to 900 MHz and stays much longer at this frequency. Windows already throttles the CPU at 92 °C (Mac OS X at 100 °C). 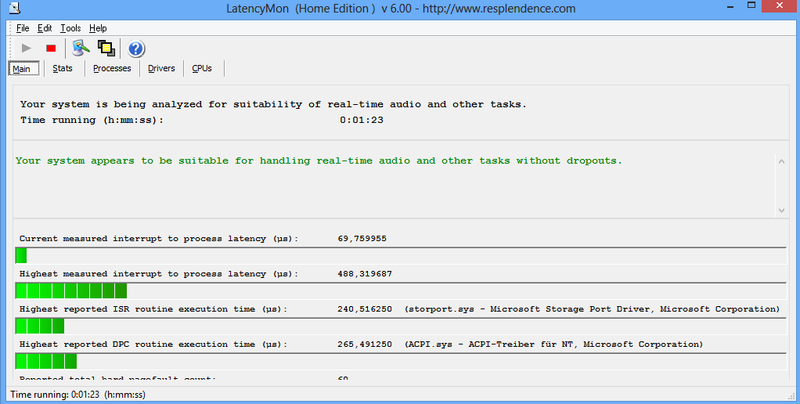 The consequence is that the CPU can keep up the performance slightly longer under Mac OS X. Similar to Mac OS X we ran a benchmark immediately after the stress test for a comparison. 3DMark 11 also manages the same score with 1,359 points. (±) The maximum temperature on the upper side is 44.5 °C / 112 F, compared to the average of 35.8 °C / 96 F, ranging from 22 to 57 °C for the class Subnotebook. (-) The average temperature of the palmrest area of similar devices was 28.6 °C / 83.5 F (-6.3 °C / -11.3 F). The consumption is very low with values between 2.5 Watts and 6.1 Watts as long as the Apple notebook is idling. The Windows results are much higher with 5.3 Watts - 9.6 Watts. The predecessor already had some issues with the 45-Watt power adaptor under load because the power consumption is higher than the nominal output. The current Broadwell version of the Air 11 starts the measurement under maximum load (stress test) at 49.3 Watts and finally levels off at 33.9 Watts. The last value can be explained with the throttling under load that we determined in the Temperature section. The lower clocks also result in lower power consumption. The manufacturer equips the small 11-inch device with a 38 Wh battery and advertizes a WLAN runtime of up to 9 hours. 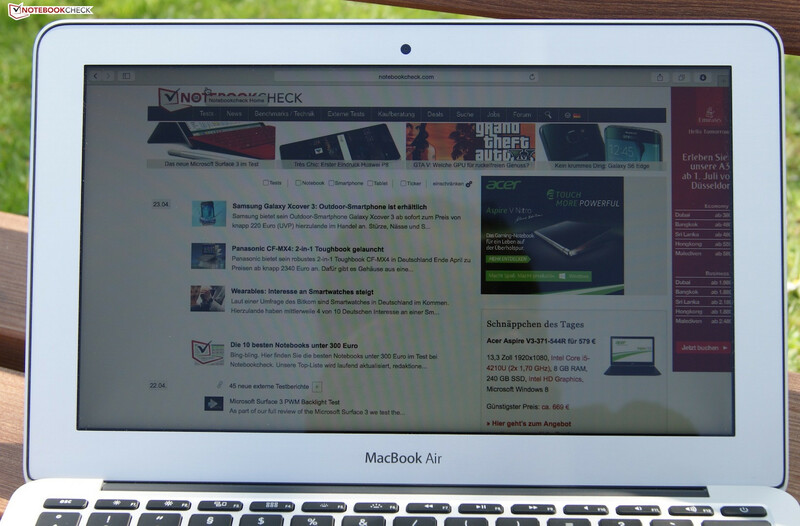 Our MacBook Air lasts around 8.5 hours in our WLAN test, which means it should survive even longer business days. A direct comparison with the 9 hours of the predecessor is not possible because we slightly adjusted our Wi-Fi settings for the test. 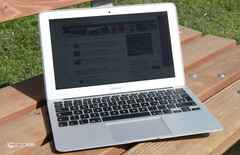 Apple MacBook Air 11, courtesy of Notebooksbilliger. The Apple MacBook Air is still some kind of evergreen in the notebook world, despite the lack of innovation. As expected, the new components inside the chassis are very convincing and the performance was increased compared to the predecessors. 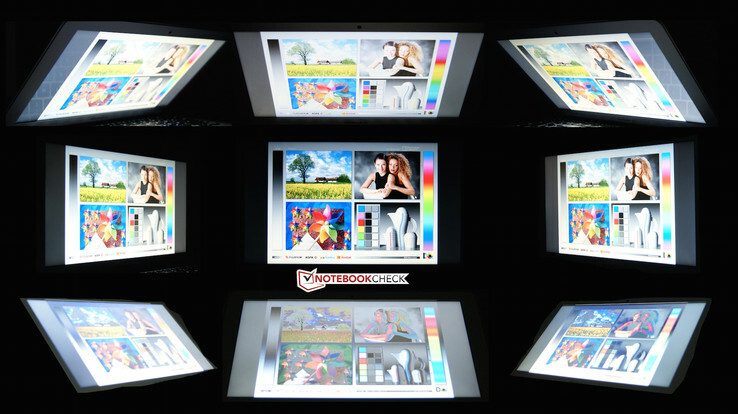 Although the display is still not a Retina model and only has limited viewing angles, you get good results for the brightness distribution, the luminance and the contrast. The biggest issue, however, is the significantly increased price in the Euro region, so we cannot recommend an upgrade for owners of previous MacBook Airs. The higher price in combination with the outdated HD resolution does affect the appeal of the Air 11. In the end, the Apple MacBook Air is still a very convenient office and multimedia notebook, which has a good mobility thanks to its battery runtime and the dimensions.